12 litre Stainless Steel. Great Quality!.. 30 litre Stainless Steel. Great Quality!.. 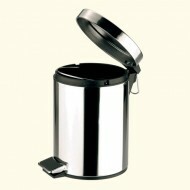 White 3-litre Round Pedal Bin Special Online ..